Know your currency — always consider the source when serving localized content. A good user experience will reference a user’s localization and region settings and adapt the interface accordingly. The most obvious example is to modify the UI and content to use the preferred system language wherever possible. However, bad things happen when UI/UX designers and mobile app developers lazily defer to a user’s localization settings without regard to the content being delivered. Though I am American and live in the US, I happen to prefer the UK region setting on my iPhone and Mac because I want the time to display in 24 hours and the date to be formatted as Day Month Year. On the Mac it’s easier to fine-tune the display of such information; on iOS, there’s much less customization beyond selecting a region. Note that my language remains the default ‘American’ English — not English (UK). There are other scenarios in which a user will select a different region from their default geography. Anyone who travels abroad, including students, tourists, and business travellers, wouldn’t be expected to switch the region settings on their devices. Also, I’ve noticed immigrants often keep their devices set to their mother tongues. I’ve documented below some egregious examples of mobile apps that have not thought through the implications of relying on user settings and end up displaying erroneous and confusing information as a result. When it comes to content being served for business offerings, the currency should be determined serverside based on the vendor’s locale — not the user’s region setting. 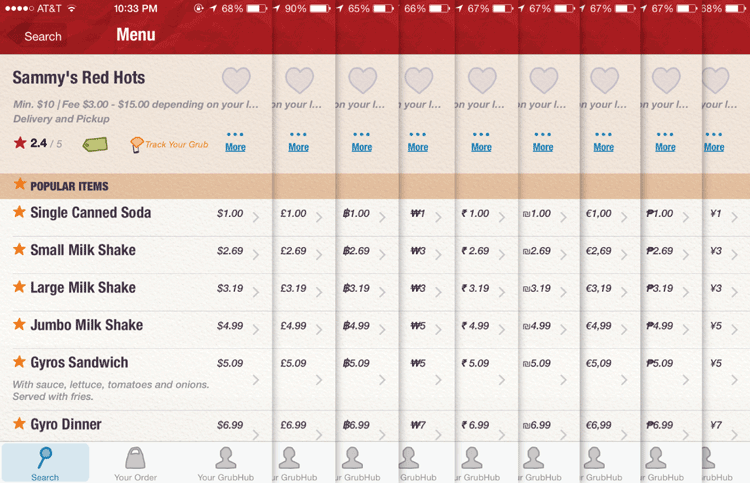 GrubHub has a mature app, but there is a major flaw in its reliance on user region settings. 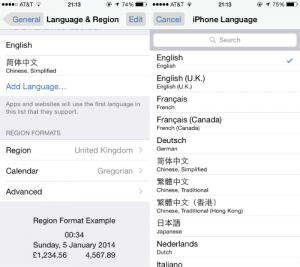 The app simply swaps the currency symbol for whatever region the device is configured to use. I doubt Sammy’s Red Hots in Austin would accept foreign tender, but even so — these prices displayed are vastly different if you were to perform the currency exchange rate. 1 USD (US dollar) is roughly 100 JPY (Japanese yen), making the Single Canned Soda appear to be 1¢ (USD) to Japanese users. Further, some currencies use commas as their decimal punctuation. GrubHub defers to this convention not only in the prices, but in the restaurant ratings as well. 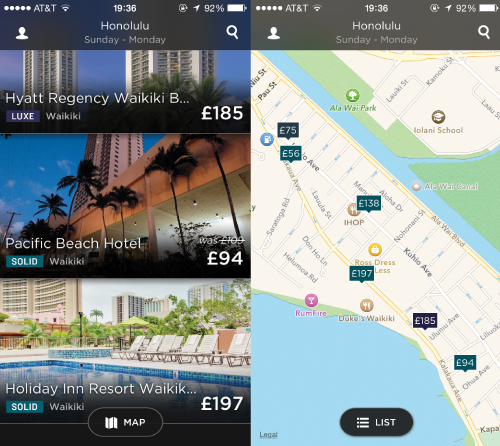 I recently was looking for last-minute accommodation in Honolulu. My friend recommended I try Hotel Tonight. I download the app, open it up, and am presented with prices seemingly in GBP (British pound sterling). Note that I am in Hawaii and authorized the app to use my GPS coordinates. The prices, it turns out, are actually in USD; Hotel Tonight simply swaps the dollar ‘$’ currency symbol for pounds ‘£’. So again, wrong information is shown and the UX is greatly diminished. Major tourist destinations have users coming in from all over the world. 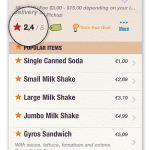 UX designers and app developers must ensure correct information is presented to users. In this case, the prices seem much higher than they actually are. 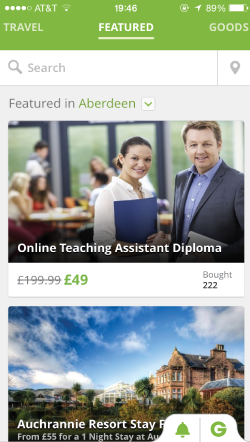 Groupon defaults its listings to UK businesses, even though I permitted the app to use my GPS coordinates. While Groupon doesn’t make the same error of displaying wrong prices (it will use the correct currency and price for the venue’s location), by defaulting me to its UK listings despite knowing my actual location, it’s a hassle to figure out what deals are near me at that moment. 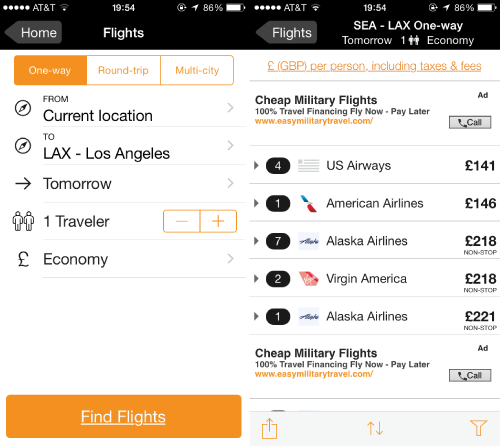 Kayak tries to help its users out by performing currency conversions on the backend and presenting the adjusted prices based on the user’s region setting. There are pros and cons to this approach. First, the positive: The information is correct. The information may be more convenient for the user if traveling abroad for a short time. The app clearly displays a notice of what’s happening at the top. Now, the negatives: For users such as myself who use a different region setting for other reasons, or expatriate users, this will cause confusion. You’d probably expect the £ Economy navigation link to take you to change the currency settings, but you’d be mistaken — it merely pops up a menu to select the cabin class. Even the £ (GBP) per person, including taxes & fees link will not let you change the currency settings. You actually have to go to the sprockets on the first view to change the currency settings for the app. This is unintuitive and cumbersome. I’ve been a visual designer for more than a decade. Like many designers, I have an acute attention to detail. I often find myself staring at various works, analyzing design decisions — colors, typography, space, composition, textures, materials — immersed in thought, taking mental notes about what works and why and what could be improved upon. This compulsion extends beyond scrutinizing mobile app designs, icons, logos, or advertisements. I examine every type of signage — directional, informational, commercial. When a manufacturer makes a subtle change to a product’s packaging, I notice. On my shaving cream. Burger wrapper. Coffee cup. Livery. I also study systems. What processes are being used, and how could it be more efficient? What technologies might be applied? Outside the exclusive L’art pour l’art realm, I believe basic design principles transcend style and motif. As a communication piece, a work must convey information to an audience. Information should be hierarchical, legible, and intuitive. In short, form follows function. I’m a fan of the Bauhaus movement, whose early students re-imagined design. One of most illustrative examples of the Bauhaus school of thought is the retake of the door knob, which had been used for thousands of years, into a door handle. A simple yet profound improvement transforms the user experience dramatically. This blog is about design. I look forward to sharing my thoughts and observations to make the world a little better than I found it.